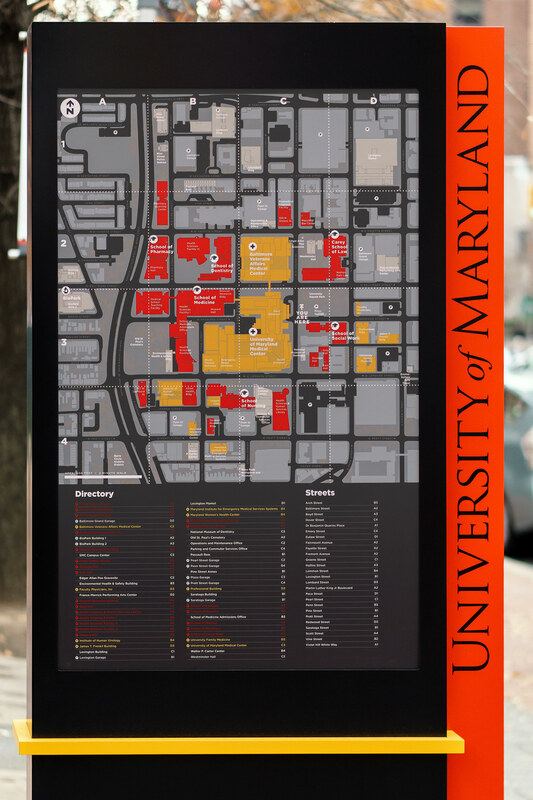 University of Maryland, Baltimore, is a public university known for some of the oldest professional schools of medicine, pharmacy, and law in the United States. It's also home to the first dental school in the world. Its founding campus includes a leading teaching hospital, University of Maryland Medical Center, as well as Veterans Affairs Medical Center, and attracts all kinds of medical, dental and pharmaceutical facilities and businesses. 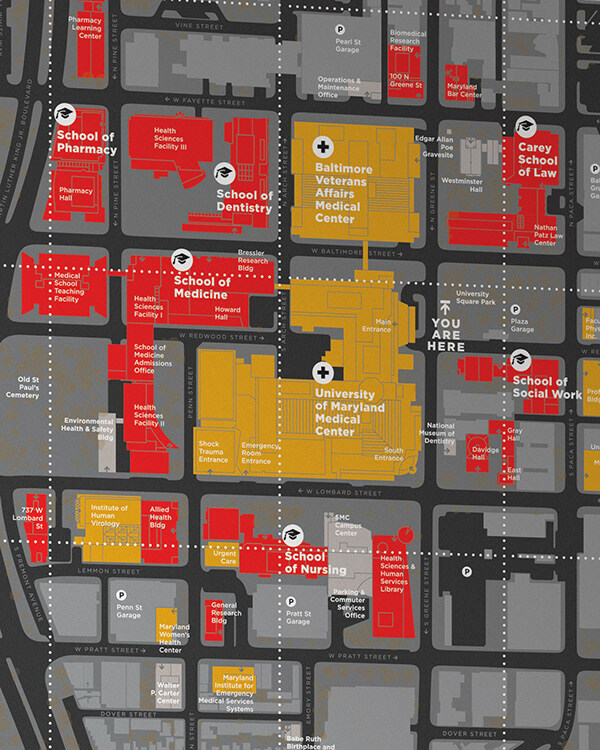 Located on the west side of downtown Baltimore, the campus is in the core of one of the most pedestrian-friendly areas of the city. 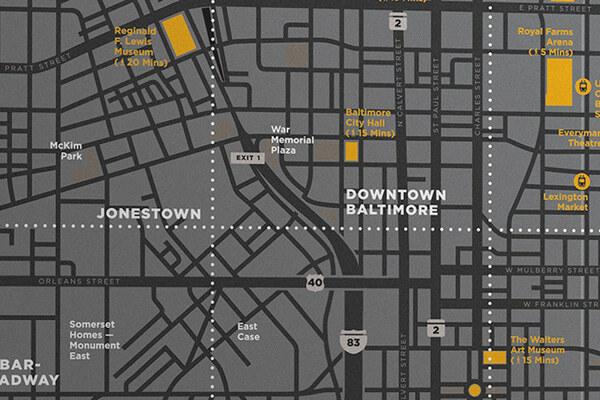 It's in the vicinity of the historic Lexington Market, and walking distance from the City Hall, Inner Harbor, and multiple public transit connections. 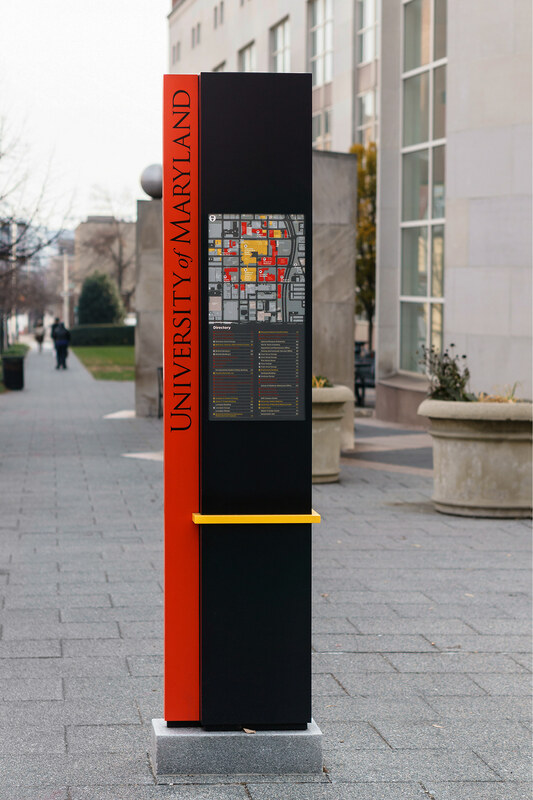 In 2016, I was asked to develop bespoke mapping for the new wayfinding system on campus. 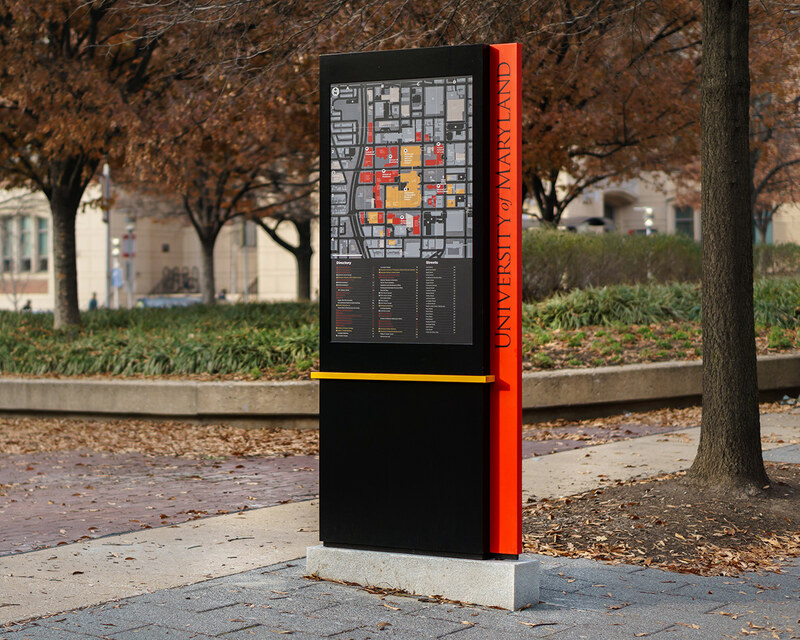 We developed two types of maps, a campus map and an area map, that were tailored to the needs of this urban location and could help all users to navigate the neighborhood efficiently. 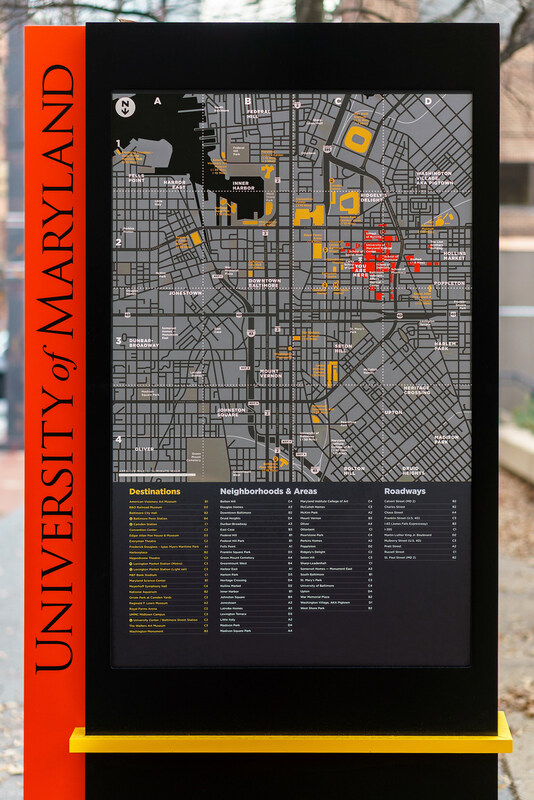 Maps on narrow pylons focus exclusively on campus, whereas wider monoliths include both a bigger, extended and more detailed campus map, and an overall map of downtown Baltimore. One of my goals in creating the maps was improving accessibility of the campus, but also doing everything possible to encourage walking and cycling in this part of the city. Additionally, area maps on the back invite readers to use public transportation, by legibly disclosing information about it. 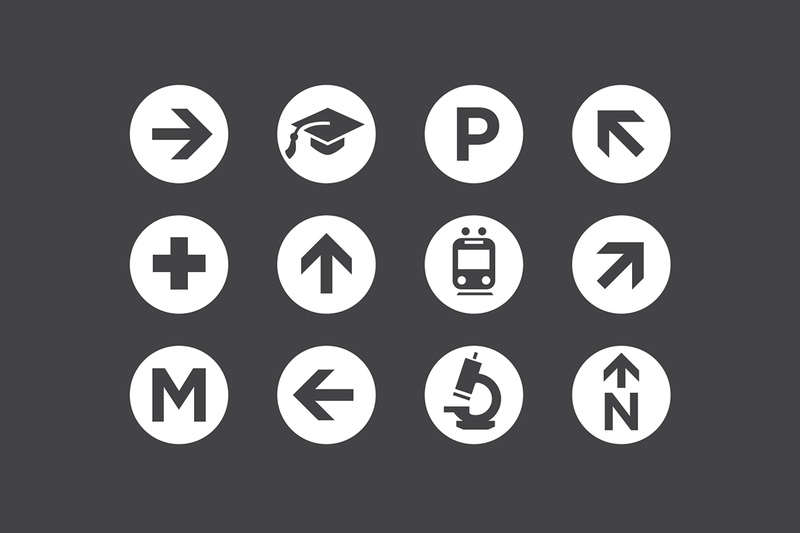 Indicators of building entrances, detailed depictions of the curbs and alleyways, helpful hierarchy of destinations, a clear index of streets and buildings all help visitors to plan their trip. 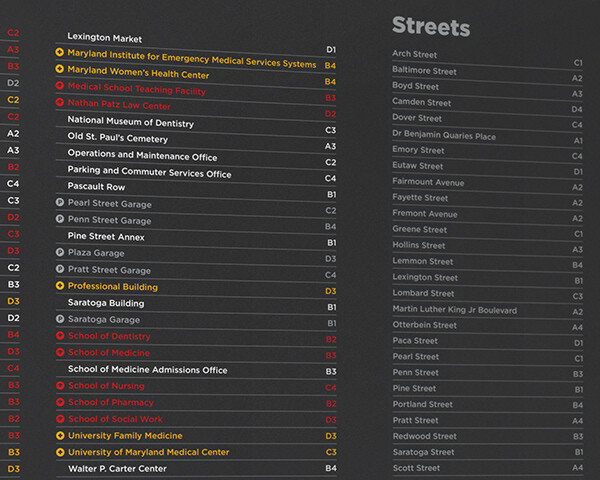 Bespoke mapping design for University of Maryland in downtown Baltimore. Two types of maps, campus map and area map, help all users to navigate the neighborhood more efficiently, sustainably, healthier and safer.